Christmas Card Delivery Service - A Christmas card delivery service ran from 1st Dec to 21st Dec. Boxes for cards were in various shops in the village and also in the Church and £376.87 was raised for Fountain Road Hall improvements. Smarties Campaign - Under the big ‘thermometer’ in the church you’ll see Smarties Tubes full of chocolate Smarties! Please help us pay for our church’s building insurance premiums by taking home a tube of Smarties, eating the chocolates, and filling the empty tube with coins (£1, 20p, 10p, pennies, or any coins you like) and return the tube filled with coins to the box below the thermometer, or place it in the offering plate. This really helps our church keep up with building insurance premiums! Thank you! 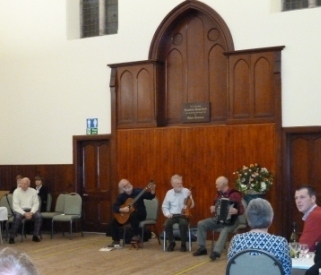 On St Andrew’s Night members and friends gathered in Fountain Road Hall to celebrate with a meal together followed by entertainment. The catering was of the usual high standard and everyone enjoyed the mince and tatties followed by trifle, tea , coffee, clootie dumpling and shortbread. 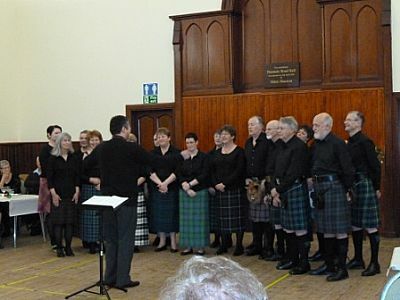 The entertainment , from piping to choral singing from the church choir and Lairg Gaelic Choir, modern Highland dancing from the Standfast Dancers was enjoyed by all. The evening was rounded off by John Macdonald and his band encouraging the gathering to participate in Ceilidh dancing. Good food, good entertainment and a chance to catch up with friends made for a great evening. Although it was mainly a social event £370 was raised. On Saturday 1st Dec many of the same group were up early organising an indoor car-boot sale and soup platter lunch in aid of Indian Village Ministries(IVM). It was well attended and raised the sum of £378.60 for the orphage in India. A group from the congregation travelled to Inverness to Eden Court Theatre to see Mother Goose. Play Scheme 8 - 10 October A big thank you to Sandra and all who helped to run a very successful play scheme once again. On the first day we had 13 kids, on the second 16, and on the last day 13. Well done to all the children who participated! 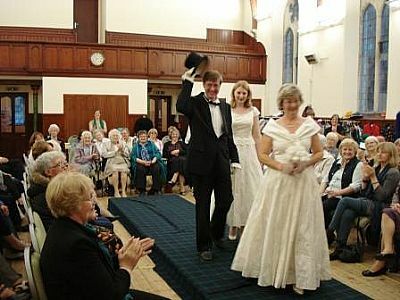 The Rev John Sterrett surprised the audience when he entered as the bride’s groom along with brides, Pamela Teska and Claire Barron, which was prompted by a storm of applause from the audience. The show was very well attended and both the models and the audience thoroughly enjoyed the evening which ended with tea and home baking. All the clothes for the show had been donated by members of the local community to help raise fund for the orphanage which is run by India Village Ministries (IVM). The next fund raising event for IVM is to be held on 1 December and will take the form of an indoor car boot sale and soup platter lunch. India Village Ministries (IVM) In January representatives from our church--the minister John Sterrett, the session clerk Isobel Murray and an elder Juna Sutherland travelled to India to visit India Village Ministries (IVM). They stayed in the home of Suresh and Roja Vemulapalli, who run IVM. They found Roja to be a wonderful cook and Suresh and his family the perfect hosts. In May this year Suresh, Roja, their son Swithin (9) and their daughter Sophie (5) returned the visit and came to stay with the minister in the manse for six days. Ladies from the church quickly put together a meal rota and cooked lunch and tea for the family every day. It was an exciting week where we could show off our parish and enjoy fellowship with our Indian friends as well as giving them exposure to other churches in the presbytery. God truly blessed us through the Vemulapalli family. Church Website - Please check out the new videos of St Andrew’s Church Choir taken from the service of Rededication on 19 February. 6 January 2012 - The Rev John Sterrett, Isobel Murray Session Clerk and Juna Sutherland Elder flew from Inverness airport on the first stage of their journey to India to visit an orphanage run by India Village Ministries (IVM). St Andrew’s Church formed a link with IVM a few years ago - see earlier article in News & Events on the visit from Dr Suresh Vemulapalli on 24 March 2011. 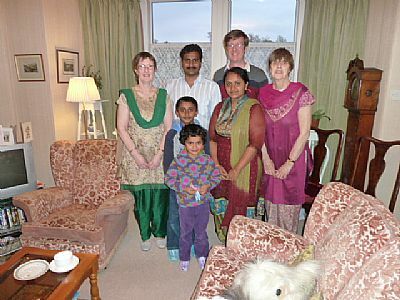 The three stayed with Dr Suresh and his family for a few days and then enjoyed a tour of Northern India returning home on 21 January. They took with them various small gifts for the children, including, pens, pencils and hair decorations. Several of the children had their birthdays whilst the three were visiting there. If you would like to know more about the work of India Village Ministries, please contact Isobel Murray, Session Clerk on 01408 633694.